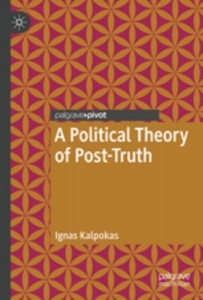 In A Political Theory of Post-Truth, Ignas Kalpokas offers a nuanced and lucid description of the conditions and content of a post-truth world, drawing particularly on the work of the seventeen-century philosopher Baruch Spinoza with support from the twentieth-century post-structuralist Gilles Deleuze. Going beyond cliches and superficial diagnosis, this is a perceptive, yet alarming, vision of an ever-more embedded post-truth future, finds Roderick Howlett. A Political Theory of Post-Truth. Ignas Kalpokas. Palgrave Macmillan. 2018. As events continue to unfold, there can now be no doubting that we in the West are now saturated in a post-truth (un)reality. The existence of post-truth signals a shift in our understanding of what is valuable and points towards what our collective future might hold. In short, although ‘post-truth’ has only formally been around since 2016, it is already clear that it is paradigmatic of our age. 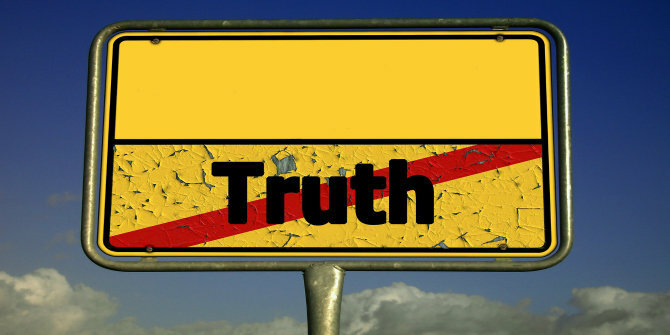 Despite this (or perhaps because of it), discussions surrounding post-truth often lend themselves to superficial diagnosis and point-scoring, rather than serious analysis. In A Political Theory of Post-Truth, Ignas Kalpokas sets himself the task of breaking this trend. His success in the endeavour is clear: Kalpokas has produced an insightful study, going beyond clichéd references to Donald Trump and ‘fake news’ to offer a lucid description of the conditions for, and content of, a post-truth world. From the outset in Chapters One and Two, Kalpokas explodes the popular notion that post-truth has any direct relation to lying. Instead, post-truth should be seen as blurring and ultimately as exceeding the dichotomy between what is true and what is a lie. Whether a claim bears any relation to truth or falsehood is irrelevant in a post-truth world. A claim may be true, or it may not be – post-truth will proffer it regardless. We should instead see post-truth as the promotion and prevalence of narratives that ‘only bear relation to pre-existing opinions and emotional entanglements of target audiences’ (32). This will subsequently result in the creation of ‘new social worlds’ formed by these narratives. Often underlined by their aspirational quality (think ‘Make America Great Again’), post-truth narratives arouse the affects (or emotional, personal feelings) of those who interact with them, offering an ‘escapist fiction’ which feeds ‘instant gratification’ (20). This principle is exemplified in those algorithms which create posts perfectly tailored to target specific audiences. These calculate a cost-benefit analysis to create content which will ‘stick’ best with those who engage with it, completely disregarding any potential normative implication. In Chapter Three, Kalpokas shows us what has led to the fertile ‘post-truth’ landscape which we currently inhabit. Through our unprecedented immersion in different forms of online media, the affective narratives discussed above are accessible as never before. This ‘mediatisation’ and ‘digitisation’ of individuals and, consequently, society can only be seen as a catalyst for post-truth. Ultimately, Kalpokas concludes that with the increase in digitised and therefore disembodied interaction, the link between actual and online self becomes increasingly blurred. This digitised self is managed and performed, with the aim of maximising affectivity prioritised above all others. The link to post-truth is clear: ‘if one is constantly immersed in crafting an embellished effigy of the self, one is more likely to omit an effort of verification [of facts] in other circumstances as well’ (74). Through this and the increase in online engagement, experience rules over information and becoming affectively influential becomes critical. Increasingly in a mediatised world, if an individual does not affect others, they might as well not exist at all. Underpinning this description of the post-truth landscape, Kalpokas invokes the thought of the seventeen-century philosopher Baruch Spinoza with support from the twentieth-century post-structuralist Gilles Deleuze. According to Kalpokas, Spinoza posited that humans are fundamentally driven by the desire for fully-satisfied pleasure. This state is never fulfilled for any significant length of time in actuality so it remains only an ideal. As a consequence, since no human is ideally fulfilled, none will stop striving (conatus in Spinoza’s Latin) to make up this ‘deficit of existence’ (68). Crucially – and this is emphasised more through Deleuze than Spinoza – power and pleasure are the central means of bridging this deficit. Through successful affective exchange with others, our capability and influence increase and ultimately lead to a maximisation of our power to act. It is not hard to see from here how Kalpokas’s Spinoza might shine light on the apparently natural human appeal of post-truth. If individuals embrace, promote and reinforce the post-truth narrative amongst others through affect, they will, at least temporarily, be able to diminish their deficit of existence. Both Spinoza and Deleuze are also contributors to perhaps Kalpokas’s most important thesis. Rather than conceiving of post-truth as an act of one-way manipulation of a helpless individual or group, we should instead see those whom many suppose are passive ‘victims’ as in fact being active in the process of dissemination, promotion and, ultimately, co-creation of their respective post-truth narratives. All affective exchanges, whether in person or online, causally correspond: we are constantly losing (through external, negative influence) and gaining (internally, through creation and reassertion) power (70). Post-truth narratives therefore appear as the ultimate means of keeping a steady flow of positive affect. By taking up post-truth narratives and adding to them (in other words, by collaborating and co-creating), we increase our stake in the power to affect and thereby close the deficit of existence. It is this insight into the collaborative nature of post-truth, as well as the philosophical underpinnings already noted, which inform the author’s heterodox conclusion. For all the negativity associated with post-truth narratives, Kalpokas still considers them ‘bearers of sense […] just not sense as we (used to) know it’ (130). By embracing post-truth, individuals embrace what comes naturally to them: a dose of affective influence, a subsequent reduction in the deficit of existence and a furthering of the experience of pleasure, creating a better (here read: more pleasurable) world. The inference to draw from this is that post-truth is creative, empowering and sense-making. As a result, Kalpokas concludes that post-truth bears the possibility of a ‘(kind of) emancipatory potential […] instead of [the] dominance of […] exclusive ways of knowing […] the current truth market is a liberal one, guided by supply and demand’. Post-truth therefore ‘becomes a competition for the induction of the greatest pleasure possible’ (127). Whilst reading this book, which is genuinely perceptive in its descriptions of the post-truth condition, I found myself shuddering at this vision of an ever more embedded post-truth world. This was not a shudder of hope, but of chaos and confusion; a critical awakening at what might be to come. The world that Kalpokas describes is driven by unmediated desire, overtly uninterested in any attempt to aim for truth and ultimately driving towards the destruction of the human subject. The liberal ‘truth market’ he describes does indeed break down the present monopoly; but it is replaced with a different monopoly, this time actively encouraged to disorient and disguise, creating false hope in those who ‘collaborate’ in its dominance. The expectation that this new (dis)order built on confusion – even if this confusion is capable of temporarily pleasing – will not be used even more effectively by undesirable forces is dangerously naïve. In these respects, the conclusions of the book were clearly heavily marked by Kalpokas’s Deleuzian pleasure-oriented understanding of human nature, as well as the associated assumption that by appeasing this nature, emancipation might follow. A richer, more dialectical approach was needed here. Ironically, that approach might be found in returning a little more to the spirit of the book’s protagonist, Spinoza. His hope in the mind’s ability to work with and against desire to arrive at truth is needed like humble bread in our confused times. Roderick Howlett is a school and university tutor in Philosophy and Religion. His BA was in Theology at the University of Nottingham, before changing to Philosophy for an MA at University College Dublin. In 2019, he plans to begin work on a Philosophy PhD exploring the influence of Søren Kierkegaard upon Theodor W. Adorno.